First of all, I have never felt so completely disgusting in my entire life. You know something is not right if you have had 2 or 3 litres of fluids to drink and have absolutely no need to go to the washroom. I am sweating through pores I never knew I had. The temperature is around 3o-35 degrees C every day, but the best part is the 300% humidity levels. How is this possible, you ask? Well, it isn't, but I am trying to make a point. I hope you were able to figure that out yourself. Anyway, be glad for the mild weather you have in Canada and the central heating you have in the winter. I think only my friends in Sicily can understand how I feel. Anyway, I'd like to draw your attention to the title of this entry. Hana-bi means flower-something. I don't know the second part, but it probably means boom or pop or pow. So, maybe flower-boom is what it means. In English we call them fireworks and today I had the pleasure of seeing the world's largest fireworks. 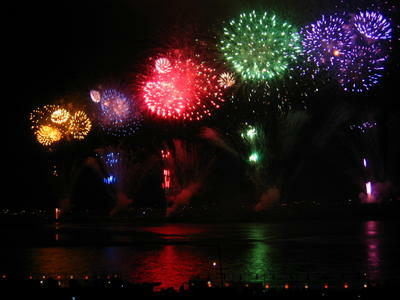 Every August 2 and 3 in the city of Nagaoka, Japan is held a giant fireworks festival. I was really looking forward to it because it is fairly close to where I live. Naturally, I researched the festival on the internet and then my enthusiasm hit a bit of a wall when I read that about 600,000 people come to see the show. Yeah, that wasn't so nice to hear, but I love the flower-booms so I was undeterred. Unfortunately, I also read that if you wanted to get a good viewing area you need to arrive by 3 PM (the show was scheduled to start at 8:30). Well, I didn't get there until about 4:30, but luckily there was still a few spots near the river to sit (this is the best area). The fact that we were on a slope that was near vertical didn't matter to my friend and I - we were there and that was all that mattered (incidentally, using the rail system in a country where you can't read, write, or speak the language and there is no one who speaks English can be interesting, to say the least ... I'm sure I will write about this sooner or later). I guess it was our lucky day because the show started about an hour early and it didn't stop for 2 hours. The interesting thing was that for a few minutes they would explain each series of upcoming fireworks and then they would set them off. They did this almost 50 times, if I remember correctly. The stuff they were saying sounded so cool. I mean, it literally "sounded" cool, but it could have been complete rubbish for all I know - it was Japanese! I have no idea what the lady said, but she did seem really nice. Anyway, the big deal about this festival is that there are a couple fireworks that are beyond large. I would say a firework that weighs 300 kgs, goes 600m in the air and has a breadth of 600m is a little unnecessary, wouldn't you? It was pretty sweet though. I could go on and on about fireworks, but that was the least interesting part, if you ask me. For me, the nuances of the Japanese culture are quite intriguing. As I said, there were anywhere between 300-600,000 people watching this show. There is a relatively small train station to handle a large portion of this sprawling mass of humanity. I was absolutely dreading the train ride home, but somehow the crowds seemed to dissolve into the night air. I mean, I saw everyone move into the train station, but the chaos was so well organized and everyone cooperated so well that the crowds were a complete non-issue. It was truly remarkable and I never seen such efficiency. Oh, and another thing that I noticed was that all Japanese people must have been boy scouts at one point. They are prepared for EVERYTHING! There were families everywhere with coolers, tables, and I think I even saw a spa or two, all of which seemingly could be folded up and put in your pocket. The other great thing was that if you showed up early enough and laid out your tarp over a certain patch of grass, it would still be there, untouched, if you left it for six hours and returned later in the day. It reminded me a little of central park. There were just masses of people covering everything, but you would still have these blue-tarp oases waiting for their rightful owners to return to them. Tell me; where else in the world could you do this? Nowhere, I tell you. NOWHERE! One final thing I would like to mention that was really neat was what everyone did at the end of the show. There were crowds lining both banks of the river and once the show was over everyone took out their mobile phones and waved at the people sitting across the river. All you could see was thousands of glowing phones flickering in the distance. It was quite a sight, my friends; quite a sight, indeed. Dean, what is up? Sounds like quite the festival. No better way to settle into a new city with some flower-booms or pops. How's the living quaters? I'm sure I'll hear about all the details soon. So hockey is starting up again, I don't know hopw much you've heard, but there's been a lot of shake ups, I'm sure you've checked it out online anyway. Should be intersting. Anyway, talk to you soon, hopefully things keep going well for you. I'm happy if you're happy Dean.